Light Nightclub at Mandalay Bay Resort & Casino in Las Vegas comes from the creative minds behind Cirque du Soleil. The first-ever nightclub turned on by Cirque du Soleil, merges cutting-edge creativity with incredible music to produce a new kind of nightlife experience. Start the VIP process with Red Carpet VIP today! Cover price: General admission is $30 for women and $40 for men. Payment information: Cash, all major credit cards. Music: A melting pot of music with world-renowned DJs. Resident DJs: Skrillex, Sebastian Ingrosso, Zedd and Baauer. Occupancy: Information not available at this time. Parking: Self-parking and valet available at Mandalay Bay. Handicapped accessible: Information not yet available. ATM: Located inside Mandalay Bay. 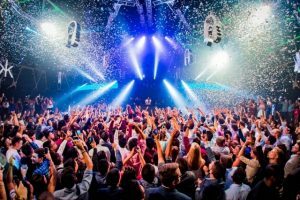 Special events: Special celebrity DJs (like A-Trak, Skrillex, Zedd and many others) perform on specific nights.